1. Steel Floor and Ceiling Tracks — (Not Shown) — Top and bottom tracks shall consist of steel members, min No. 20 MSG (0.0329 in., min bare metal thickness) steel or min No. 20 GSG (0.036 in. thick) galv steel or No. 20 MSG (0.033 in. thick) primed steel, that provides a sound structural connection between steel studs and to adjacent assemblies such as floors, ceilings, and/or other walls. Attached to floor and ceiling assemblies with steel fasteners spaced not greater than 24 in. OC. 2. Steel Studs — Corrosion protected steel studs, min 3-1/2 in. wide, min. No. 20 MSG (0.0329 in., min bare metal thickness) steel or min No. 20 GSG (0.026 in. thick) galv steel or No. 20 MSG (0.33 in. thick) primed steel, cold formed, designed in accordance with the current edition of the Specification for the Design of Cold-Formed Steel Structural Members by the American Iron and Steel Institute. All design details enhancing the structural integrity of the wall assembly including the axial design load of the studs, shall be as specified by the steel stud designer and/or producer and shall meet the requirements of all applicable local code agencies. The max stud spacing of wall assemblies shall not exceed 16 in. OC. Studs attached to floor and ceiling tracks with 1/2 in. long Type S-12 steel screws on both sides of studs or by welded or bolted connections designed in accordance with the AISI specifications. 3. Cementitious Backer Units* — Nom 1/2 or 5/8 in. thick boards with square edges attached to studs with 1-1/4 in. long, Type S-12, corrosion resistant, wafer-head steel screws, spaced 24 in. OC. Joints covered with glass fiber mesh tape. 4. Batts and Blankets* — Placed to fill interior of stud cavity, 3 in. min thickness. 5. 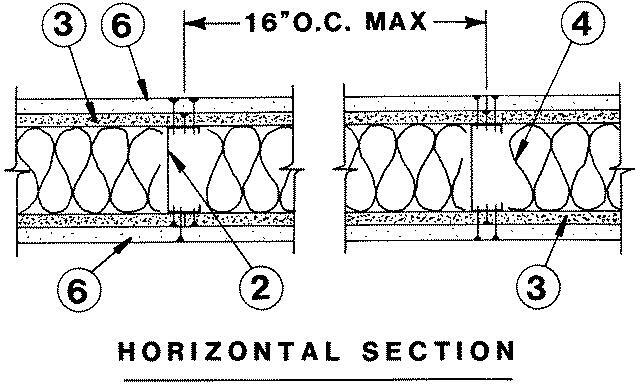 Lateral Support Members — (Not shown) — Where required for lateral support of studs, support may be provided by means of steel straps, channels or other similar means as specified in the design of a particular steel stud wall system. 6. Gypsum Board* — Nom 5/8 in. thick boards, applied vertically, attached to studs with 1-5/8 in. long Type S-12 steel screws, spaced 8 in. OC along the edges of the board and 12 in. OC in the field. CGC INC — Type AR, C, IP-AR, IP-X2, IPC-AR, SCX, SHX, ULX, USGX, WRC, WRX. GEORGIA-PACIFIC GYPSUM L L C — Types 5, DAPC, TG-C, Type X, Veneer Plaster Base - Type X, Water Rated - Type X, Sheathing - Type X, Soffit - Type X, GreenGlass Type X, Type X ComfortGuard Sound Deadening Gypsum Board, Type LWX, Veneer Plaster Base-Type LWX, Water Rated-Type LWX, Sheathing Type-LWX, Soffit-Type LWX, Type DGLW, Water Rated-Type DGLW, Sheathing Type- DGLW, Soffit-Type DGLW, Type LW2X, Veneer Plaster Base - Type LW2X, Water Rated - Type LW2X, Sheathing - Type LW2X, Soffit - Type LW2X, Type DGL2W, Water Rated - Type DGL2W, Sheathing - Type DGL2W, Type DGG, Type DAP, Type DS. PABCO BUILDING PRODUCTS L L C, DBA PABCO GYPSUM — Types C, PG-11, PGS-WRS. USG MEXICO S A DE C V — Type AR, C, IP-AR, IP-X2, IPC-AR, SCX, SHX, ULIX, ULX, USGX,WRC or WRX. CGC INC — Type AR, IP-AR or IP-X3. UNITED STATES GYPSUM CO — Type AR, IP-AR or IP-X3. USG MEXICO S A DE C V — Type AR, IP-AR or IP-X3. 6B. Gypsum Board* — (As an alternate to Items 6, 6A) — Nominal 5/8 in. thick, 4 ft wide panels, secured as described in Item 6. 6C. Wall and Partition Facings and Accessories* — (As an alternate to Items 6, 6A, 6B) — Nominal 5/8 in. thick, 4 ft wide panels, secured as described in Item 6. 7. Laminating Adhesive* — (Optional) — (Not Shown) — Used to bond inner layer of Mineral and Fiber Board (Item 3) to outer layers of Gypsum Board (Item 6). ANSI A136.1 Type 1 organic adhesive applied with 1/4 in. square notched trowel. See Adhesives (BYWR) in the Fire Resistance Directory or Adhesives (BJLZ) in the Building Materials Directory for names of Classified companies.